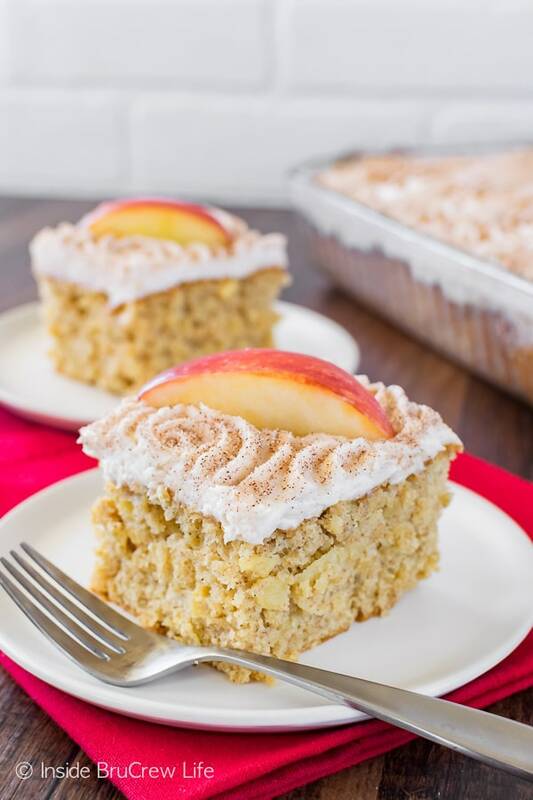 Creamy frosting and a dusting of cinnamon sugar will make this Snickerdoodle Apple Cake disappear in a hurry. 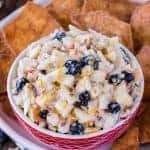 One bite and you will be ready to devour your entire piece in seconds. *This post was sponsored by Crunch Pak apples. I am partnering with them as a blog ambassador creating delicious apple recipes. This week I sabotaged all of our healthy eating plans…with apples. I know that sounds kind of funny. I mean how can you ruin healthy eating with a fruit, right? Well, if you are me, you dice those apples into bits and toss them into cake batter. Those bags of apples in the fridge didn’t know what was happening. The idea for this sweet cake has been rolling around in my head for some time now. This week I finally put it together and then promptly ate half of it. I tried to keep telling myself that it was ok because I was just eating fruit. Ok, fine. It was fruit covered in the creamiest, most delicious frosting ever! One of the perks of working with Crunch Pak apples is that we get bags and bags of fresh apples during the month that I am creating a recipe. My kids love having apples in the fridge, so that they can pack them in their lunches or eat them anytime. 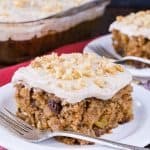 I love having bags of apples on hand because I like to bake things like this apple praline cake and apple Snickers cake. Anyone else sensing a pattern? Apparently, I prefer my apple a day in cake form. The past few apple cakes that I have made have been totally from scratch. 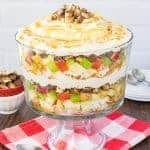 So, this month I decided to show you how to jazz up a cake mix with three kinds of apple love. 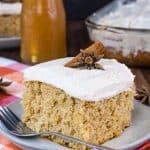 Apple juice, applesauce, and fresh shredded apples give this fluffy cake a delicious apple flavor. I added some cinnamon to the batter and the frosting, so that the cake had more of a snickerdoodle taste too. To finish the cake off I sprinkled cinnamon sugar on top of the frosting swirls. The last touch was to place an apple on top of the cake slices, so that they looked even prettier. I guess that means this cake actually has four times the apple love! Our oldest son got home from school and had cake as soon as he walked in the door. His exact words were that this cake was phenomenal! He also blamed me for ruining all his healthy eating plans for the week because now all he wanted was cake. I know what you mean, son. Eating two large pieces of this snickerdoodle apple cake probably wasn’t the smartest thing I did because now my skinny jeans hate me. But holy heck, did it taste great! I just couldn’t help myself. 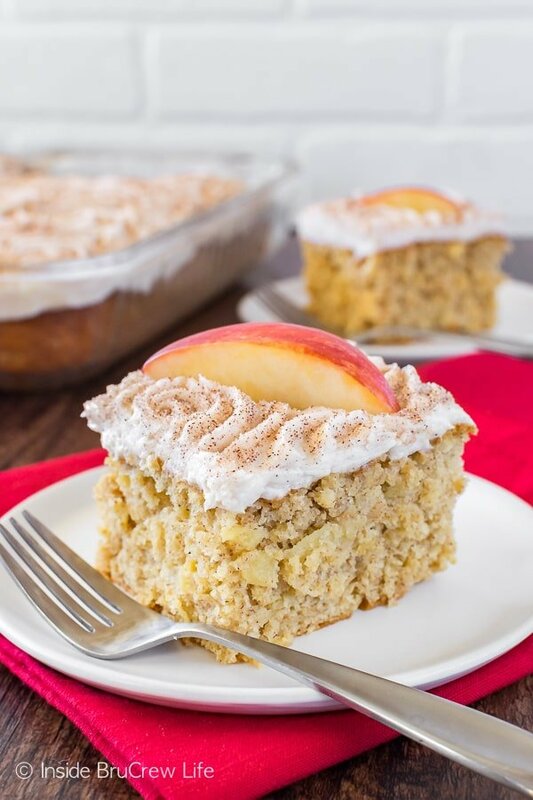 Creamy frosting and a dusting of cinnamon sugar will make this Snickerdoodle Apple Cake disappear in a hurry. Mix together the cake mix, pudding mix, apple juice, applesauce, eggs, cinnamon, and nutmeg. Beat on low speed for 1 minute, and then 2 minutes on medium speed. Stir together the apples and flour, and then gently stir into the cake batter. Spread the batter in the prepared pan. Bake for 35-38 minutes or until a toothpick inserted in the center comes out mostly clean. Let cool. Beat the butter and vanilla until creamy. Add the salt and cinnamon and beat again. Slowly beat in the powdered sugar and heavy whipping cream until light and fluffy. Spread on the cooled cake. Mix together the sugar and cinnamon. Sprinkle on top of the cake. 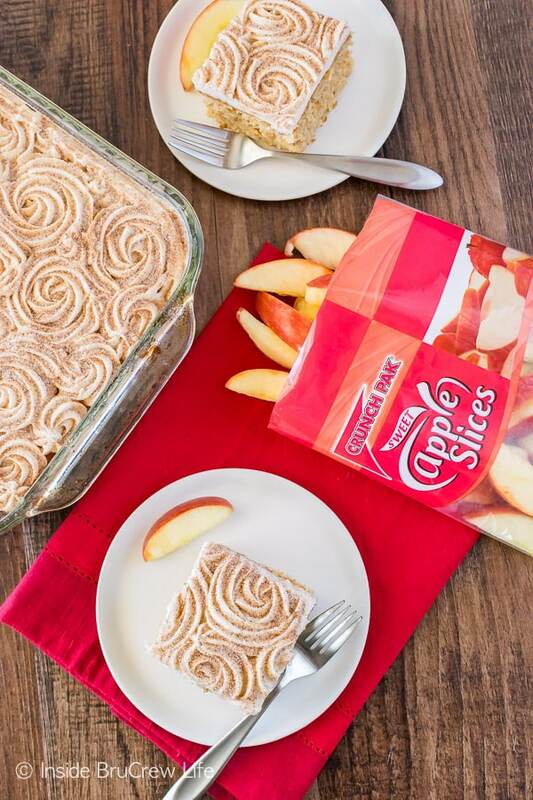 Serve slices of cake with apple slices. *You can also use a piping bag and large icing tip to swirl the frosting on top of the cake. *I was compensated for my time as a brand ambassador for Crunch Pak apples. All opinions expressed in this post are 100% my own. I LOVE how you paired snickerdoodles with apples! Such a brilliant combo since apples and spices = total food heaven! I am crazy for this cake! The frosting is beautiful and the cake looks so tender and perfect. I am a huge fan of Crunch Pak apples because I cannot bite into apples, so the fact that they are pre-sliced and even already portioned out make it that much easier for me to enjoy them! I’m confused. 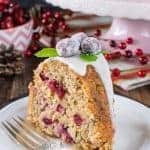 I see the list of ingredients but NO directions on how to make this cake. No guidance on what goes into the came and what goes into the frosting! HELP!! Ok, so I am trying to find the problem with the recipe card, but I can see the recipe card with ingredients and instructions when I go into the post. What device are you using to read my blog? This is just such a happy cake. And since it has apple, totally fine for breakfast, k thanks! there are getting to be so many sponsors on your website that I can’t get to your story or recipe – please stop counting all your money and think about your subscribers for a minute – loyal reader about to unsubscribe !!!!!!!!! I am so sorry to hear that the ads are bothering you. I did go to my page on desktop and mobile to make sure the ads were working ok. All of them were easy to close out using the little “x” at the top of the boxes. Ads are one of the ways that I am able to continue providing free recipes on my blog. Yes, I do make some money from them, but it helps to support my family and pay bills. Hopefully you understand and will continue to read and try the recipes here. How yummy this cake looks. I will be trying th Is soon. I love snicker doodles so I know this is going to be great. It is something a different than the norm. Thank you for sharing. 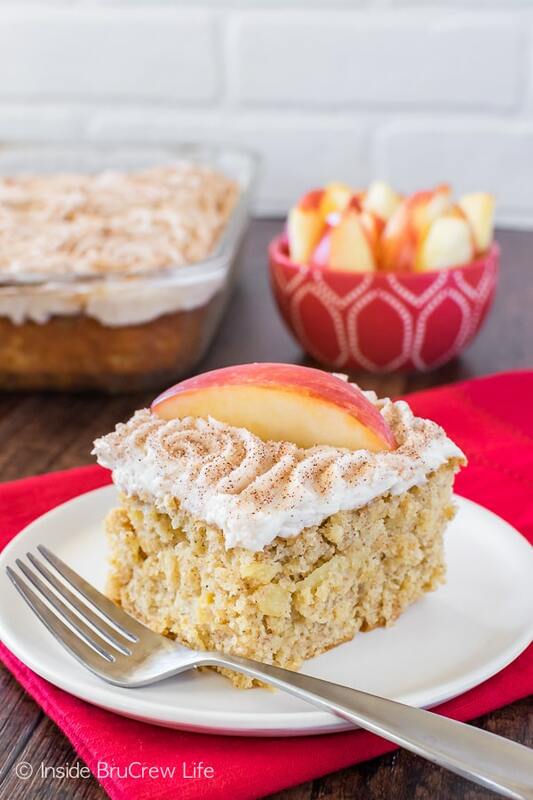 Snickerdoodle Apple Cake?! 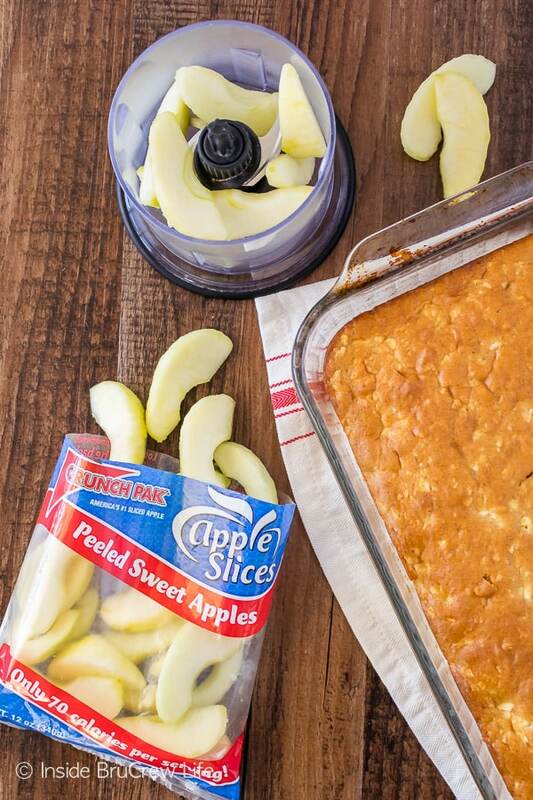 What a perfect way to use those apples! I love that you turned one of my favorite cookies into a cake. It looks absolutely delicious! This cake is gorgeous, Jocelyn! Please share how you created the rose frosting! The cake is irresistible on its own, but the frosting is stunning! Well this looks absolutely fantastic! What kind of apples are in Crunch Pak apple packages? I never know what kind of apples to use for baking. I appreciate the fact that you are plugging Crunch Pak apples, but what if I can’t find them at the grocery store? There’s a big difference in what kind of apple you use for baking, I’d just like to know. Most of their apple packs are Gala or Granny Smith. I hope that helps. You call for the apples to be shredded. Are you just grating them? Did you measure them before or after shredding? Can’t wait to make this, it looks wonderful. I use a food processor that shreds them, but a grater would work just as well. You want to measure them after grating/shredding. I hope you enjoy the cake!! !